Our human body is 55% to 78% water, depending on body size. We cannot live more than about a week without drinking appropriate water (fresh, clean and not salty). Freshwater ecosystems provide food and livelihood for many of the Earth’s people. Approx 70% of our planet Earth’s surface is covered in water, most is salty water in our oceans. All of the life forms found on earth are believed to have originated in some way connected to water. People use water in many ways – for agriculture, for generating energy, for recreation and for sanitation – to name a few of the ways we use water. As an environmentalist, I am aware of how man’s actions impact the quality of water. Of how our insatiable need for fuel leads to polluting our oceans and waterways with oil – not just, as in the recent Gulf of Mexico disaster; but for a very long time now in Africa and South America. These negligent activities impact real people in real ways – their food sources, their clean drinking water, their livelihoods and their general health and well-being. Often these are what is called indigenous people, native humans who have inhabited those areas for a very long time. Sadly, too often, corporations play shell games with ownership changes, to avoid facing the costs of cleaning up after they have finished taking the resources they desire. There is no way that a corporation, the responsible, non-human, legal entity (yes, I know there are humans controlling it) can care in the same way a rooted people cares. How can they care in the same way, that the people living there must care ? It isn’t a reasonable expectation. As a child of the Southwestern United States desert, I have always been highly aware of the role of water in my life and of the need to use it wisely. Water and the impoundment of it, remains a serious issue in the geographical area where I was born and grew up. 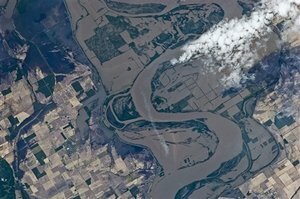 While the general focus for this year’s Blog Action Day is clean drinking water, and I have already acknowledged the importance of that and some of the adverse conditions impacting the availability of that, I am going to use my own blog space today, to talk about this issue of impoundment. In Missouri, I experience an abundance of water – in perennial streams and rivers, and in having a multitude of springs of all sizes – we are very blessed by an abundance of this resource, which grows more critical in its quality and availability globally. The United Nations expects demand to outstrip supply by more than 30% around 2040, with global water consumption is doubling every 20 years. In the state where I reside (Missouri), water is used to produce electricity. This is considered a positive effort, decreasing our dependence on oil and coal, for that necessity of modern life. The most unique generating facility is not far from where I live, on a mountain top called Taum Sauk about 90 miles from St Louis. This facility is notable for being a pure pump-back operation with no natural primary flow for generation. This blog is the story about how that impoundment failed, what the damage from that was and of the surprising recovery and benefits of that event. It is a story of how Life improves itself; and in sharing this story with you, I hope to inspire optimism that recovery even from the worst aspects of man’s use of water, is always possible. I was sound asleep when our weather radio came on warning of flash flooding on the Black River. This seemed strange to me, as it had not been raining. 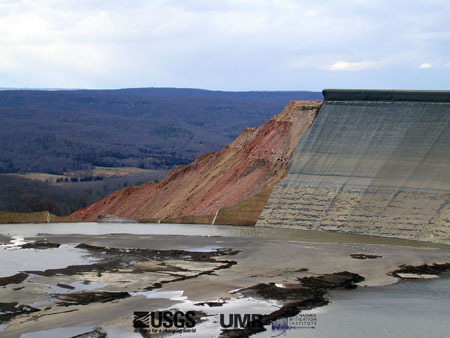 Only later, did I learn that the Taum Sauk dam had failed at 5:12 am that morning (Dec. 14, 2005), and unleashed a huge environmental impact, as over 1.3 billion gallons of water cresting on a 20 foot high wave headed down the steep mountainside, towards the East Fork of the Black River. The reservoir was emptied in just 12 minutes. The rush of water began destroying everything in its path, all the way through Johnson’s Shut-ins State Park. The 5,000 acre/foot lake was built by AmerenUE between 1960-1963. 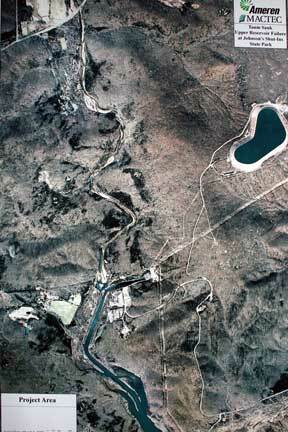 The upper reservoir is drained through a pipeline in the middle of the mountain and runs through electric generating turbines and the “spent” water is deposited in a lower reservoir. I had visited the original dam more than once, as well as the nature center on the way up that mountain. At the time, there was no restriction to just driving up on a whim. There was no security at the site. On Aug 7, 2010 I joined many others in touring the new $490 million dam at Taum Sauk. The facility is now highly secure (which put the nature center out of access – its assets are being moved to other locations). Even though a lot of damage occurred to take the old dam unintentionally out-of-service, what has resulted from the event, appears to be only positive – in terms of how much safer the dam structure is now (it was completely rebuilt from the ground up, there is a new routing for water with a spillway, if the dam were ever to over-top again and multiple fail-safe redundant sensors). 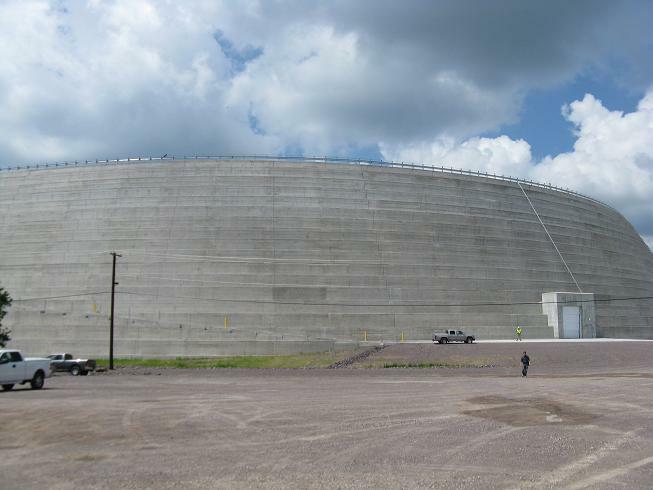 AmerenUE’s officials claim that the new dam may actually last thousands of years because it has been strongly rebuilt (and is the largest roller-compacted concrete dam in North America, using almost as much concrete as was used in the building of Hoover Dam near Las Vegas, NV). The new dam was recognized by the US Society on Dams with an Award of Excellence in the Constructed Project. On Aug 7, 2010, we also visited Johnson’s Shut-Ins State Park, so that we had a more “complete” understanding of the whole event and what has happened since. 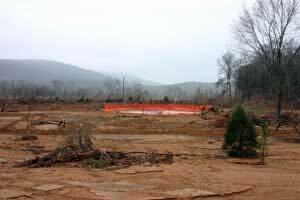 I learned that over 8 feet of sand and clay plus 15 feet of downed trees ended up deposited in the state park after the water was no longer pouring through. The force of the volume of water pouring through the breech, unbelievably, moved boulders, even some as big as cars, all the way into the park. 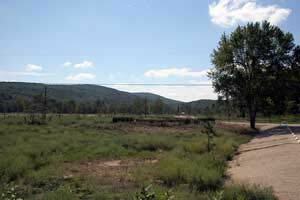 The debris created a dam causing a temporary 6 acre lake to exist, where one had not been before. The unique rock formations that are the swimming hole, where crystal clear waters have mostly delighted hot summer visitors, were murky and full of soil that had been carved from the mountain. Above is how the park looked before the breech. The rushing water filled the campground not only with natural materials but with the concrete and rebar that had been the dam. The Park Superintendent’s home was washed away down to its foundation. The family (including wife and 3 children) were deposited in fields downstream (remember it was December when this happened – good that there weren’t the masses of tourists, bad that it was very cold). In the photo below, you can see what was left of this home’s foundation (area that is orange). The only structure that “sort of” survived was a vault toilet, which still lost its rear wall but the fixtures, rolls of toilet paper and even a flypaper strip remained. To the park service employees, one of their saddest losses was a 9 acre Fen. This is a combination of seep forest and calcareous fens found in the flood plain of the East Fork of the Black River. Seasonal floods pond rain water and calcareous ground water seepage. Seep forests are rare in Missouri, hence the special attention this area received. Union Electric (now AmerenUE) built Taum Sauk between 1960-1963, claiming it did not require any Federal permits to do so. That contention was challenged but in the meantime, the facility was opened without federal inspection of its construction. In 1965, the case had reached the US Supreme Court and the decision was that it was under federal jurisdiction, though its faulty design was allowed to remain. It was faulty because the earthen dam was not of bedrock but “dirty fill”, a high concentration of sand, which was substandard, even by 1960s standards. Other dams of such design had previously failed in a similar way. 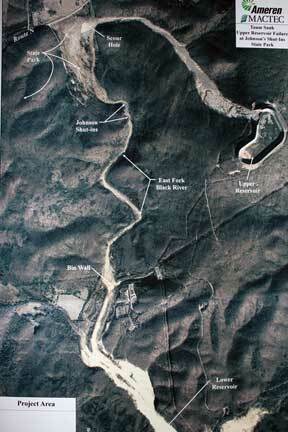 While this was not the main cause of the breech (which was the failure of the computer system sensors to indicate the reservoir was full and therefore, the pumps kept bringing up more water), when it finally over-topped, the faulty construction facilitated severe erosion that led to a 656 ft gap in the dam. Contributing to the failure was minor leakage through the dam wall that had caused the breech area to slump lower than remaining walls (this was a known problem that had been addressed by lining the reservoir with a membrane in 2004). 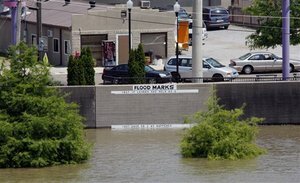 Only months before the failure and collapse, company memos indicated observation of an overflow in the breech area, caused by wave action related to winds from Hurricane Rita in late Sept; and in Oct, it was noted that the gauges were malfunctioning. There is evidence that a person on duty “raised” the gauges and that the gauges had been moved when the investigators arrived. The Independent Panel of Consultants who investigated the breech also noted the omission of any kind of spillway from the design. The Missouri Coalition for the Environment and the Missouri Parks Assn were parties to lawsuits (including attempts to deny a rebuilding of the dam). 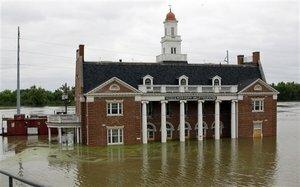 Eventually, AmerenUE agreed in 2006 to pay $15 million after the Federal Energy Regulatory Commission determined that negligence (operating errors) had led to the overflow and collapse of the structure. In 2007, Ameren UE agreed to pay approx $180 million to settle a suit brought by Missouri’s then Attorney General (now governor) Jay Nixon. Certainly, some of those proceeds went into the rebuilding and recovery of the Johnson Shut-Ins State Park’s new and well furnished amenities. In spite of AmerenUEs reckless behavior, their request to rebuild was approved and construction began in 2007. Insurance covered most of the cost of rebuilding. The utility was prohibited from billing their customers for any part of the expenses the failure and collapse caused the company. The Johnson Shut-Ins State Park was quite primitive before the breech. The park totals 8,549 acres and was donated to the state of Missouri by Joseph Desloge (a well-known lead mining name, who was also a St Louis civic leader and conservationist). Since the breech, its recovery has turned it into a modern, state of the art, recreational and educational destination. Its educational value was greatly enhanced by the disaster itself. Before the event, the park was known primarily for its water filled, shoots and slides of rock, to frolick upon on hot, summer days. There is now a beautiful new visitor/interpretive center and a new and re-located to safer ground, campground, just in case. I will admit that it is a bit disconcerting to see the signs posted along the trails indicating a person should immediately head 1,500 ft uphill (not sure of that distance but it is significant considering the rough and steep terrain there), if they hear a warning siren sound. There are plans to connect the park with the larger Ozark Trail and to create a backpack camp. During the recovery effort, mangled trees were mulched and truckloads of sand and sediment were removed. Native grasses and saplings were planted. New topsoil was brought in. Wetland ecologists and soil biologists were brought in to determine how to restore the fen, which was under several feet of sand and sediment. An industrial vacuum was used to remove this material in some places, in the more sensitive areas only shovels, rakes and wheelbarrows could be used as an attempt was made to salvage the unique vegetation buried there. Time was of the essence, for these plants had to be salvaged in only a few months, by spring. Recovering the fen was the park’s first major recovery success. The primary educational benefit comes from 900 million years of earth history, in the form of geology that includes rocks from at least 3 geologic periods. These are now visible in the scour channel that remains from the breech. This is an opportunity for geologists that happens rarely. The scour channel is now the newest and one of the more fascinating features of the park. It is the reminder of how the water came down so very fast, from that steep slope at the top of this channel; and then, spread out when it hit the flatter valley floor. As the flood slowed, the water started dropping all the solid material it had carved away from the mountain. Walking among the angular, basketball-sized rocks, of rhyolite, dolomite, granite, sandstone and chert, is still difficult while hiking in the scour channel. Volcanoes created the St Francis Mountains (I learned at the center that there is a chain of 3 Calderas in our region, south of St Louis) erupting 1.4 to 1.5 billion years ago, which formed the Rhyolite rock that became the mountains (which were higher than the Rockies at one time). Not long after, holes left underground by these explosions began to collapse, a pattern than continued for centuries. The volcanic mountains were later covered by a sea (long before the glaciers melted, fish swam there or dinosaurs roamed) and some part of that 530 million yr old beach was near the top of the reservoir mountain, before the breech occurred. This period, when the Midwest was underwater, was just before the supercontinents began to pull apart. The igneous rock was then covered by thousands of feet of sedimentary rock such as limestone, sandstone, shale and dolomite. In the low places, the swift Black River has created a feature known in Missouri as a Shut-in. This is a place where hard rock, in this case igneous, shuts in the flow of the river. 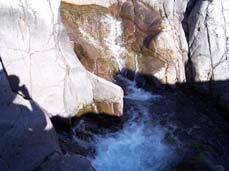 At Johnson Shut-Ins, the water’s action of swirling and churning has created potholes, water slides and miniature canyon like gorges. My family hiked the Scour Trail from Route N to an overlook about midway up the channel, before we told the children about the swimming hole. We had not come dressed for swimming but my boys all swam in their shorts and pants without their shirts. The shoots and slides are wonderfully clear and clean once more. We would have liked to have gone up the scour channel a bit further, towards the reservoir mountain but it was brutally hot, giving us an excuse to return for another hike in milder weather.